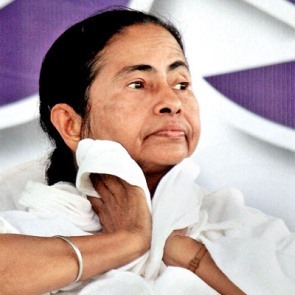 West Bengal Chief Minister Mamata Banerjee could be staring at troubled times ahead as the Saradha scam trail seemingly leads up to her doorstep. Indrani Roy/Rediff.com reports. Central Bureau of Investigation agents probing the Saradha chit fund scam have their hands full. With fresh allegations surfacing about West Bengal Chief Minister Mamata Banerjee reportedly having given the nod to a deal between the Indian Railways Catering and Tourism Limited and Saradha Tours and Travels -- reportedly, a branch of the Saradha chit fund company -- when she was the Union railway minister, the CBI has expedited its probe process. The so-called 'deal' was part of the Bharat Tirth project that Banerjee announced in her Railway Budget 2010-2011, which envisaged launching 16 special trains connecting popular tourist sites and pilgrimage centres across the country. Sources told Rediff.com that jailed Trinamool Member of Parliament Kunal Ghosh allegedly played a role in helping Saradha win the contract. The central agency now plans to grill Ghosh at length, the sources added. In an interview to Rediff.com last year, Ghosh had mentioned, "Years back, when the Saradha group was just launching its media companies, a meeting took place between the West Bengal chief minister and (Saradha founder) Sudipta Sen."
"'Didi, apni CM theke PM hoben, ami media house ke seibhabei sajachchhi (Didi, I am setting up my media houses in a way that it helps you become the PM).' This is what Sen had told Mamata," Ghosh had revealed in his interview. Rediff.com has learnt that it was during this meeting that Banerjee reportedly agreed to help Saradha 'win' the contract with the IRCTC and that Ghosh was an 'important facilitator'. The CBI believes that interrogating Ghosh could provide leads in the case, the sources said. While Trinamool Congress leaders have been desperately trying to de-link themselves from the Saradha fiasco for the past one year, news of this alleged contract between the IRCTC and Saradha has further complicated the issue. The Opposition has been crying foul, as Banerjee's trusted aide and former Union railway minister Mukul Roy initially attempted to clear his name in the controversy instead of defending the Trinamool leader. 'It (the deal) didn't happen during my tenure. Authorities like the Railways audit department, the CAG (Comptroller and Auditor General), etc will look into it,' Roy had told the media. Capitalising on the Trinamool discomfiture, Pradesh Congress President Adhir Chowdhury demanded Banerjee's resignation. 'The report clearly indicates the direct involvement of the then railway minister. If Banerjee and her men are speaking the truth and these allegations are false, she should step down from the CM's post and face an inquiry. She may resume office only if she comes out clean,' Chowdhury said on Thursday. Roy went back on his statement within 48 hours and claimed that Banerjee was not at all involved in the Saradha fiasco. The IRCTC also published a statement on Thursday which said Saradha Tours and Travels was never a service provider and received no special privileges.